Not so in Manila. Late October is the end of the rainy season and the weather is starting to get a bit drier and sunnier. 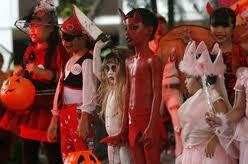 But we’ve had typhoons disrupt the Halloween festivities before, so they are no guarantees of a rain-free event. But last Saturday our early Embassy Halloween party was dry with even the occasional breeze. But that didn’t mean there weren’t a lot of sweaty spidermen in their black stretchy costumes, running around in the heat. Its hard to wear a mask or man-made synthetic outfit without a river running down your neck or back. And a kids party is not really the place to come as Tarzan, Pam from Baywatch or some other scantily clad character. But that would have been much more practical! I think everyone had fun though, they just headed back into the AC when things got too hot. 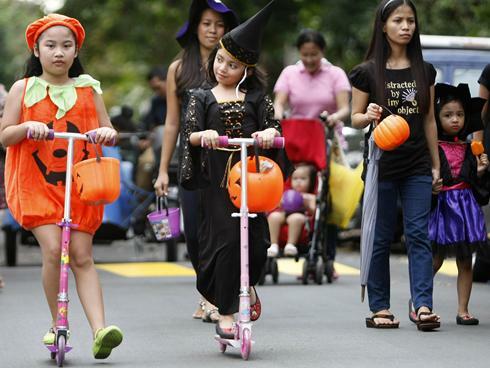 Halloween is surprisingly big here in Manila. Not as big as Christmas, of course, but noticeably present. 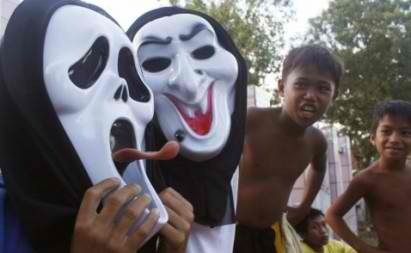 But then Filipinos do have a propensity towards many things American, and Halloween is also a big dress up event. Filipinos love parties, dressing up, all things sweet…so what’s not to love? Well..costumes and humidity perhaps. And there seems to be some that consider it anti-Christian, but despite the church and the weather it continues to grow in popularity. Happy early Halloween everyone!